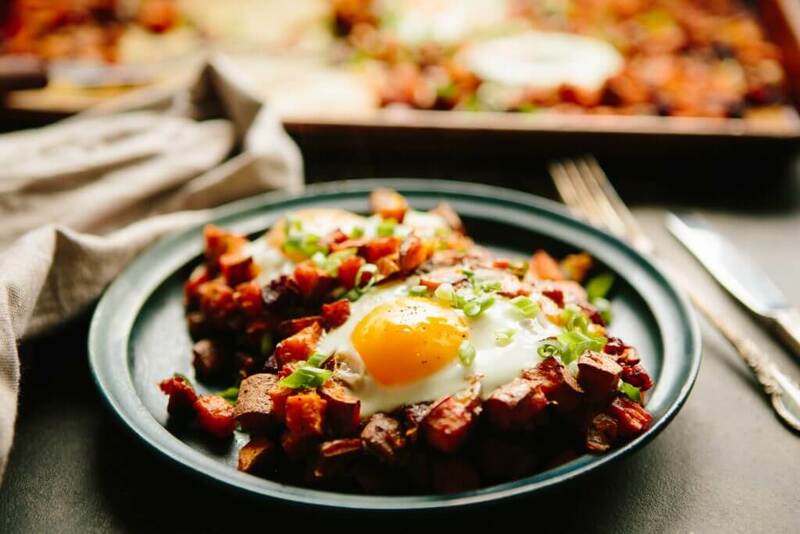 Start your morning deliciously with Sweet Potato & Chorizo Hash with Eggs. Yours truly adds a sweet balance to the spicy chorizo. Dust with some smokey paprika for a breakfast home run that is sure to satisfy any morning cravings. Preheat the oven to 425 F degrees. Line a large sheet pan with parchment. Combine chorizo, onion, and sweet potatoes with 1 teaspoon salt, pepper to taste, and olive oil. Toss to coat, then spread out into an even layer on the pan. Bake for about 15 minutes. Stir, then bake for another 15-20 minutes, or until browned and crisp. Carefully crack the eggs over the hash, being sure to leave a bit of room around each one. Season each with a little bit of salt and pepper. Bake until the whites are set but the yolks still runny, about 10 minutes.